I use the same laptop for both work and personal needs. This is useful but makes me see to keeping my work-life balance. 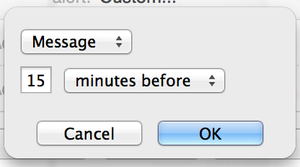 I do this simply — turn off all the applications running when I finish my working day in the evening. The only issue is not to forget to open them again next day. But this process can be automatized. :-) The most important is to run the applications which are in use by the other team members. For example, I a Jabber app has to be running since the workday has started. The same goes for any other messenger. 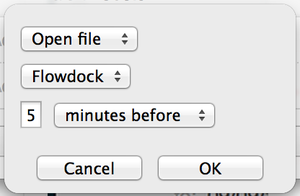 We here at AppGyver use Flowdock for team communication. So I needed to be sure that it is open every morning. 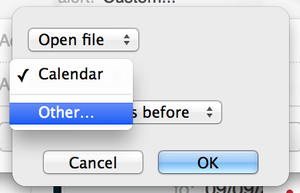 It turned out that this is doable on Mac with the native Calendar application. Let me show you how exactly. I named mine “Run Flowdock”. Do not bother about the laptop being opened by the event time your are setting up. The application can run in advance. My event has 9:35 time. This event should be repeated every week at the workdays. Now the most interesting thing. 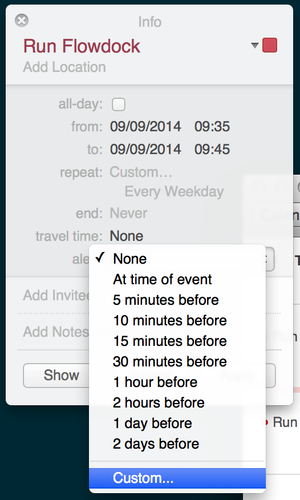 You can run any application using custom event alerts. Choose the last item in the alert select, which is Custom. 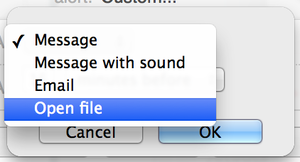 Once the next dialog is opened, choose Open file. By file they mean an applicaiton to be run. It is defined to be Calendar by default but you can choose another one. Then, select the application needed in the Finder dialog. In my case it is Flowdock. Then, fix the time. 5 minutes before 9:35 is exactly half past nine. Let me remin you, this does not mean that you need to be at work by this time and have your laptop opened. You can be riding a bus or even sleeping. The application will run later, when you open your computer. Not ideal, indeed. If your calendar is synchronized with iPhone, it peeps by this time. The phone cannot run the application, so it reminds you about the event with sound. But as one of my friends suggests the workaround can be to create a separate calendar for such event and not to synchronize it with other devices.